My garden trellis idea seemed simple enough. I had the farm tools and I just needed to connect them together and stick in the ground, right? This post contains affiliate links for your crafting convenience. Now that I had the farm tools in hand, I needed some scrap wood for the cross slats that would both connect the tools and provide more surface area for plants to climb onto. So, I headed to Habitat ReStore for some wood trim that would do the job and cost very little. Before actually building the garden trellis, I figured that the handles of the farm tools would go into the ground far more easily if the ends were tapered like a stake. So, we used our vintage drawknife to shave off the ends of each handle- just enough to be more stake-like (a chisel would work, too). Now, all we needed to do was attach our wood trim to the backs of our farm tools like lattice. Easy-peasy, right? We laid out the tools and sawed the trim down to size- three pieces, progressively shorter in length. First, we tried screws with the drill…but the drill (no matter the setting AND using pilot holes) torqued the screws in half. Those garden tool handles are dense as all get out. Then we tried hammer and nails- which worked, but we nearly split the wood trim pieces with the force needed to get the nails into the tool handles. Successful, but with a hefty side of aggravation, we hammered in three nails through the back of the top (longest) piece of wood trim. To add insurance, I wrapped jute twine around each connection/joint, as tightly as possible. I actually liked how it looked on my garden art, so that was just a bonus. But we still had 6 nails to pound in! And the wood trim pieces just didn’t look like they could handle it. So, shhhh…I used wood glue for the middle and lower pieces of trim. I clamped the trim to the handles, let the glue set for 24 hours, and then I wound the twine around each connection again. Maybe the easy way out, but I’m building a garden trellis…not a ladder to climb on or something! In hindsight, perhaps a nail gun would have been the best solution. But I didn’t own one at the time and as excited as I was about building a garden trellis, I didn’t want to go out and buy one at the time. And there it is- all frustrations are in our rearview mirror now, so I can enjoy that the garden trellis turned out beautifully! You’ll notice that our center tool “stake” is much longer- on purpose. It will act like a tap root on a tree, and the side “stakes” will act like training wheels. I highly recommend this tip! The big test- sticking the garden trellis in the ground! But ta-da, it worked like a charm (at least in our rain-drenched soil). I love that it acts as primitive decor and garden art, but still functions as a garden trellis for whatever plant we place it by. And the farm tools that we used like a garden spade and garden fork were really perfect for it. And you can almost ALWAYS find those lurking in the corners of thrift stores. 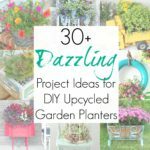 And if you’re looking for more upcycled and repurposed Yard & Garden ideas, I hope you’ll check out my full collection here! I have some garden tools that were my grandfather’s that I was considering getting rid of since I didn’t need them. I guess I will be keeping them for now. . . There you go, Mary Ann!! Perfect! That is really awesome. Wonderful and cute. Thank you for sharing. If you will use a drill and drill bit to make a pilot hole before you try to put in a screw or even a nail in hard wood you won’t have to worry about splitting the wood. Makes it much easier. Oh we did! Always start with a pilot hole- and the screws still torqued in half! Such a great trellis idea! Might make one for my garden. Your so creative! Love it! Will have to keep my eyes open for some old garden tools, I have just the place for one of these. Thanks for sharing! Pinning! Oh, I love this idea! You did such a great job and its so fun and unique. Super cute Sarah! After a bit of frustration, it turned out great. I have everything to make one next Spring. Surprisingly, screws would probably go in a lot easier than nails. Thanks for sharing the how to’s with SYC. Even with pilot holes, they didn’t! But we just have a Porter Cable hand drill, ah well! SWEEEEEEEEEEEEEEEEEET!! Many thanks for linking up at Vintage Charm! oh my gosh, this is so cool! Love it, but don’t love the work that seems to have to go into it. I love this! It is too cute!! I was just wondering how I am going to fix my broken down trellis that got destroyed by this crazy wind storm and weather we are having. It has about 3 years worth of a clematis on it so I think I will just tie a garden tool to it to hold it all up! I see those vintage tools all the time but pass them by, not knowing what to do with them. Now I do! Thanks for a great idea. What a fun idea and a nice way to upcycle! It looks great! Such a clever idea! I think I may do a mini version of this for a table setting. Pinning this to one of my boards. Oh, that’d be adorable, Sarah!! This is the cutest idea ever, and I think I may need to use this idea for my rose bush out front this spring. Love it! What a great idea for a trellis! Pinned it. This project was well worth the frustration. I love your vintage tool trellis. Thank you for sharing at Vintage Charm! Oh I love this. What a great creative idea! I’m glad you linked at Share a Cup. Today I featured Jan’s party at my blog. Come over and comment on her feature post to enter Jan in a giveaway! What a fun and unique way to use old garden/farm tools. Definitely a conversation starter. What a clever idea! I love giving new life to items that might otherwise end up in the trash. That looks really great. But, and it’s a BIG SAFETY BUT, be very carefull those tines on the hay fork don’t cause an injury to people whose face is at about the same height as the fork. A really nice project that should last for years, well done you. Oh my goodness! This is so clever and creative — I love it!!! Great Idea but I would ad a 2 foot piece of Re-bar at the base (one foot connected to the handle the other foot to stick into the ground ) so the Handles just barely hit the ground since Wood Rots fast in the ground. Too cool! Great idea, I have some extra tools and am going to gibe this a try. Will be great for my green beans! And will last longer too. Thanks for sharing! That is one awesome idea……..kudos! !! Thank you so very much, Terry! A crafter’s dream: Create something new from something old, inexpensive, functional, fantastic, and beautiful. You’ve hit all the marks. I’ve always said, “I’m not an artist”. However, I am very good at playgerism. You can bet I will be playing with this idea. Hi, Arturo! I think you’re probably right- it was a probably a CD rack. Thanks! ok, i understand , thank you for your time and help . That is so clever and cool. Great idea. The very first picture made me smile. That is so cute! What a great idea. And the trellises in the stores are so cheaply made and flimsy. Your creativity is a true gift from God! Thanks for sharing! I had to laugh. In your very 1st picture, there is a cd holder. I bought exactly like that one at a yard sale and it is now a trellis for a small vine on my front porch. Love it, Love it, Love it!!! What a cute and creative way to use up those yard tools! I give you lots of credit on drilling and hammering the nails, only to find that glue was the solution! Been there, done that, so I know your frustrations! Even if I have to thrift or buy them, I will certainly be making this project! Thank you so much for such a cute and creative post! I made a bunch of these about 10 years ago to sell. they are not as easy as they look!!! (as is often the case, when you’re good at something you make it look easier than it is. I believe we had to make a jig to drill them. we no longer make them, but they are still cute. Well, as you probably saw in our post, we, too, had a heck of a time building it! If you had drilled pilot holes before you put a screw in that would have worked great! I like using screws because I don’t have the strength to drive in a nail. Darling idea, keep them coming! This is so cool! You’re a smart girl. This is so cool and so creative. I love anything repurposed so this really got my attention. Such a cute trellis! Your thrifted tools became yard art. I really like the decorative effect of the added jute twine, too. That is adorable! What a fun idea and great way to reuse things that can’t be used for their normal purpose any more. I love it! I love, love, love this idea Sarah. 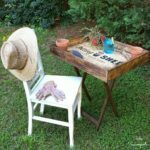 We have tons of old rusty garden tools in the shed that would be just perfect for this. what a truly unique idea! you don’t see that everyday in blogland! Haha, very true- thanks so much! What a fabulous repurposed trellis! Thanks for sharing @Vintage Charm! Sarah, you know that I lo-ooove this trellis. Not only does it use repurposed items, but it’s so stinkin’ cute and practical, too. That’s a win-win-win. Thanks for sharing at the This Is How We Roll Link Party. Oh you know I love this!!!!!!!!!!! !